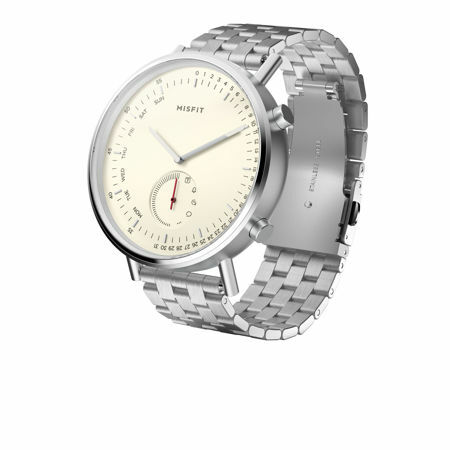 The Misfit Command Hybrid Smartwatch will arrive in a sleek, stainless steel case complete with matte finishing, where it would make it the most fashion-forward hybrid smartwatch to roll out from the company to date. It is able to discreetly conceal its technology behind a watch face which is not only modern, but also carries elements of the traditional look. One will be able to opt for either a silicon sport strap or a stainless steel bracelet, enabling the Command to deliver endless style possibilities courtesy of a wide range of 20mm strap options. Similar to its hybrid predecessor, the Phase, the Command is also a fantastic companion when it comes to keeping track of your personal fitness. It is able to track steps, the number of calories burned, figure out the distance traveled, as well as determine your sleep duration and quality courtesy of a 3-axis accelerometer. One can also opt to create and receive customized notifications when it comes to calls, texts, emails, and other kinds of apps. All of these are done via an unassuming subeye with graphic icons for easy notification identification and daily goal progress. In addition, users are able to leverage auto-update time and date functionality, second time zone, and vibration alarms to remain connected without having to check out the display at all, while a smart button will function in the same vein as that of a remote control so that users can play music, take a picture, connect to other smart devices, and ring their phone. Expect this swimproof and water resistant to 50 meters timepiece to arrive in Black Steel, Black Copper, Navy Blue, and Steel colorways with an asking price of $149.99 apiece.